A year and a half after moving onto to our land things are really shaping up. 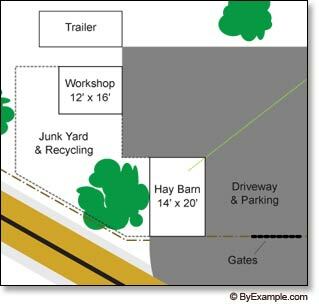 We've established our barn and garden areas, have redesigned our house plans and have a pretty good idea of how our homestead will be laid out. "The Plan" retains plenty of the original concepts, though now our map includes a number of structures that have actually been built and we are much more certain about the positioning of future structures. This map shows the boundary lines of our 2.25 acres. 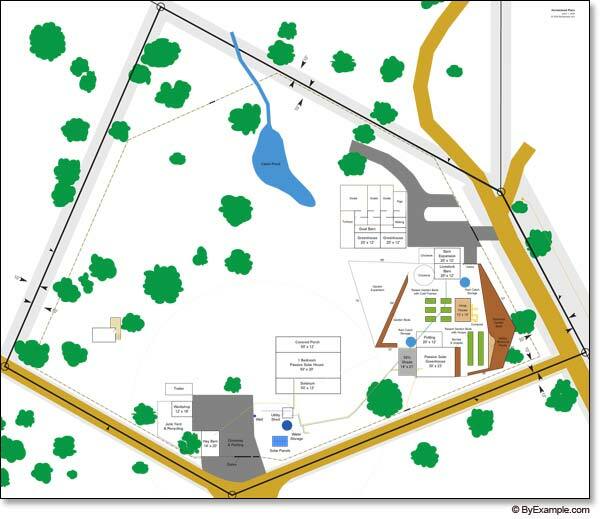 Click here to view our homestead map as a PDF. The first building to be erected on our property was the utility shed. 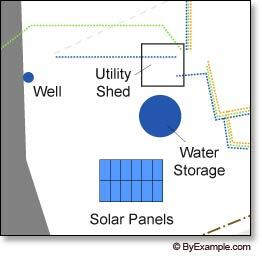 An important first structure, it provides a central and sheltered location for all of our homestead utility controls. It houses the controller, batteries and inverter for our solar power system. The water manifold and well pump controller are also located within the utility shed. Our satellite Internet dish is fixed to the top of the structure and the satellite modem is also located inside the utility shed. It is quite convenient to have all of the controls for our water, solar power and Internet systems in one building. Expensive parts are in and protected from the weather and if maintenance is needed that too can be done inside without worrying about the wind or sun. We've also insulated the utility shed to keep the batteries and equipment at a moderate temperature. Without running water or our solar power system we would not have been able to easily construct the other structures that are now on our land. It was necessary for us to build the utility shed first, so that we could use the utilities right away. We decided to put off the construction of our home in order to get started with homestead food production. The next buildings that we turned our attention to were the passive solar greenhouse and livestock barn. These two buildings are fully enclosed and insulated, though there is still work to be done on both. Despite unfinished appearances, we have put both structures to use while we carry on with the finish work. Our passive solar greenhouse is an experimental design and we are in the process of tweaking it for better growing results. We currently use it for winter time growing, starting seedlings and potting plants, as well as packing, preserving and storing our garden harvest. The barn is currenly home to our dozen egg laying chickens and small herd of breeding rabbits, as well as animal feed, straw and hay. We established our first garden area conveniently between the greenhouse and barn. It consists of 6 raised garden beds. These were our primary garden beds last year, though this year we are expanding quite a bit as you can see by the homestead map or in our garden planning article. We've designated future spots for berries and grapes and have plans to install a hoop house in the garden, perhaps next year. There are rain catch barrels planned for the future, so we've made sure to leave those spots open when creating the garden spaces. Our garden fence attaches to both the barn and the greenhouse, defining and protecting our livestock and plants. The arrangement creates an efficient work center with all of our agricultural activities happening in one area. Manure is produced in the barn and moved out into the garden for fertilizer, from the garden the vegetables are taken into the greenhouse for processing, the scraps are then carried to the garden compost or right out back to the chickens. It all happens conveniently in our agricultural center. We are very satisfied with this aspect of our homestead layout and feel that it makes all of the time that we have spent mapping and planning worthwhile. Once we began enjoying our own eggs, vegetables and meats we became even more interested in producing our own foods. We are making plans for a second flock of chickens, goats, pigs and eventually turkeys. Our initial livestock barn was designed to be expanded to the North. Soon we will be undertaking that project. It will be home to our breeder chickens who will supply us with fertilized eggs for hatching. We will also install several more rabbit cages in the barn expansion. A separate room in the barn will also be constructed for indoor butchering. The Goat Barn is also designed to be built in phases. The first construction phase will include the milking room, one goat stall and one goat yard. Off to the side there will also be a pig pen. Ultimately we will expand to three goat yards and stalls, as well as a separate pen for turkeys or other fowl. The more growing space, the better. 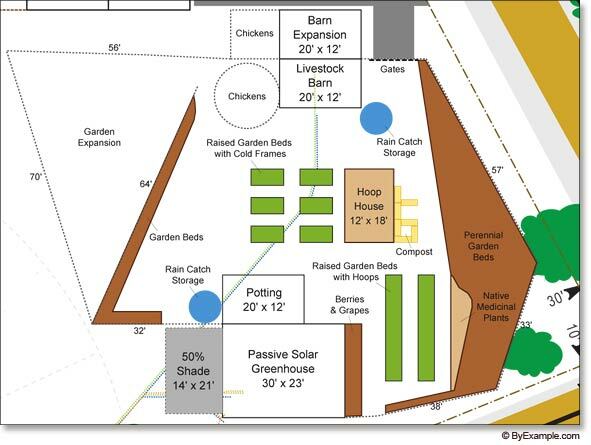 We're planning to build additional greenhouses on the south side of the goat barn. 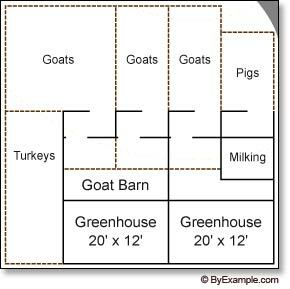 The structures will share a wall, that way any heat energy that bleeds off of the greenhouse will help to warm the goat barn in the winter. We may grow dwarf trees in the greenhouses, but we'll just have to wait and see. The site for an orchard is also under discussion, but that project is also a ways off in the future. This past fall we constructed a hay barn, though it will be a while until hay is ever kept inside. Currently we are using it to store construction materials and furniture that we will use in our future house. We kept the barn's intended purpose in mind when designing the structure and we located it by the road so that hay can be easily unloaded. Space has been reserved for a future workshop and the travel trailer will eventually be repurposed for a studio. We've determined where our future home will be -- and it will have a spectacular view from the front porch. Already we've shared several floor plans for our future home, though we haven't settled on a final draft yet. Recently we were inspired by a visit to an organic, earthship-style home and want to revisit our house plans once more. Building our home is something that we feel inclined to take our time with. We want to practice and polish our building methods on barns and greenhouses before undertaking such a large-scale, permanent project. Until then, we'll keep designing and dreaming about the house we are going to build.